2017 brings an end not only to this past year but to an era in advertising. Next year, TV advertising will no longer account for the majority of advertising dollars spent in the United States. Digital advertising has taken over a significant chunk of a very large pie. Media advertising in the U.S. will reach $200 billion in 2016. In case you hadn’t guessed, the U.S. is by far the world’s largest media advertising spender. The country’s budget more than doubles that of its closest competitor, China (Statista). The increase in digital advertising expenditures is a relatively intuitive conclusion. However, let’s unpack the observation a bit more with a focus on one particular segment. This article highlights some of the most important predictions made about native advertising trends in 2017. By better understanding these trends, your brand can be more strategic with its marketing expenditures. Likewise, publishers seeking sponsorship opportunities may take heed of the specific types of native advertising coming to dominate the scene. 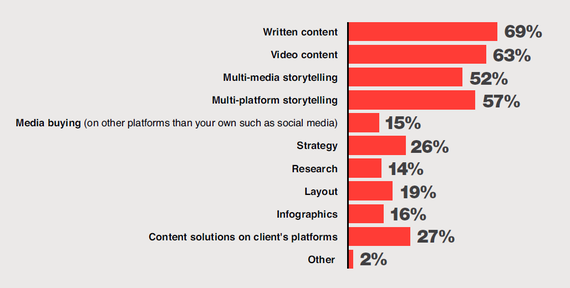 Not all native advertising is built the same and not all forms of content will grow equally. According to a Business Insider (BI) headline, native ads will drive 74% of all ad revenue by 2021. 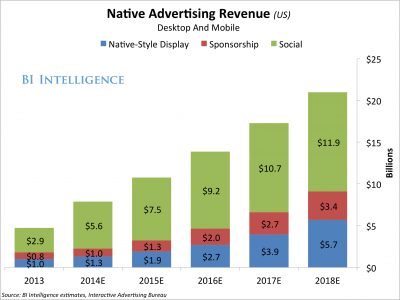 BI data further suggests that spending on native advertising in the United States will reach $21 billion by 2018. While the largest segment of native ad spending is in social media, the fastest growing segment is native-style display which is expected to grow by more than 200% over the next two years. Different Types of Native Advertising – What’s Trending? Let’s quickly clarify the differentiation BI makes between types of native advertising. Native-style display ads, like the one below found on Yahoo‘s news feed, appear alongside the site’s content. Social native ads, like a Facebook News Feed post sponsored by Nike or a promotional tweet featuring IBM, are displayed on social media channels looking like “regular” posts. Sponsored content ads are paid for by brands but published by authors (videos, blogs, Instagram posts, etc.) in their own style and voice. As depicted in the chart, sponsored content will be the fastest-growing micro-segment over the next five years. Similar to the BI predictions, The Huffington Post estimates that advertising revenue generated by native ads will reach 33% by 2018. In the same article, The Huffington Post also references studies which suggest global native advertising will surpass $58 billion annually by 2018. HuffPo explains that the most significant opportunity for investment in native ads by brands currently lies in sponsored written content (see chart below). 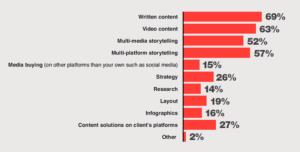 Notably, native advertising videos follow closely behind the written models. The expectation is that video-based mediums of communication will continue to adopt native ads into their business models. Not by chance do we see partnerships like the monster Turner and Snapchat pairing. Adweek reported the expansion of this partnership which is now set to include original programming, sports, and news. Boasting 150 million daily active users, Snapchat has surpassed Twitter in that category (Bloomberg Technology). Check out this informative video from Fortune discussing the battle between Facebook and Snapchat for video supremacy. Of course, Facebook and Twitter are also trying to disrupt the traditional viewing of television watchers. Stay tuned. Futurists have long touted the rise of virtual and augmented realities. Any skeptics in the advertising world were silenced in 2016 by one simple yet seminal application, Pokémon Go. Forbes underscores its success, reporting that, at the app’s peak, it generated $10 million in ad revenue each day! Moving forward, marketers can no longer ignore the potential of VR/AR. Users have now clearly demonstrated an interest and enthusiasm for the medium. Native virtual reality advertisements, here we come. Diversification and customization are perhaps the most appropriate terms that we should use when speaking about the future of native advertising. Forbes recently highlighted an increasingly common form of native ads, native music advertising. That’s right, “Pandora and Deezer are experimenting with sponsored songs, playlists and radio stations,” and today’s music videos showcase brand logos and product placements. We shouldn’t be surprised by native advertisements appearing in any form of future media. As we see the proliferation of mobile devices coupled with rising numbers of people gaining online access, the exponential increase of spending on ads to reach those eyeballs via every available channel will continue. We look forward to reading any comments you may have. Feel free to suggest topics for us to write about for future posts!